Wednesday, February 06, 2019, at 6:00 p.m. Direct Staff to assist or coordinate with you. Direct Staff to place your issue or matter on a future Board meeting agenda. Comments should be limited to three (3) minutes or less. Your comments should be directed to the Board as a whole and not directed to individual Board members. Any writing or document pertaining to an open- session item on this agenda which is distributed to a majority of the Board after the posting of this agenda will be available for public inspection at the time the subject writing or document is distributed. 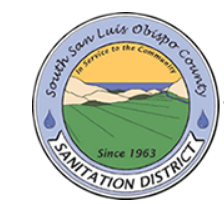 The writing or document will be available for public review in the offices of the Oceano CSD, a member agency located at 1655 Front Street, Oceano, California. Consistent with the Americans with Disabilities Act (ADA) and California Government Code §54954.2, requests for disability -related modification or accommodation, including auxiliary aids or services, may be made by a person with a disability who requires modification or accommodation in orde r to participate at the above referenced public meeting by contacting the District Administrator or Bookkeeper/Secretary at (805) 481- 6903. So that the District may address your request in a timely manner, please contact the District two business days in advance of the meeting. Recommendation: Receive and File Report.